Since I last posted about my Bolex Stereo system, I’ve made a bit of progress getting the whole thing together. I bought an old 16mm projector on E-Bay, which doesn’t quite have the right size lens mount, but the stereo lens fits inside, so I’m sure I can improvise something to make it a snug fit. I bought an ancient Norwood Director light meter on Craigslist, but the sensor seems to be dead. I’m going to try using my digital still camera as a makeshift meter. I finally figured out how to take the polarizing filters out of the projection lens. It’s in a little metal ring pressed up against the glass. There are small tabs on the inside of the barrell that you can just pull on gently and the whole thing slides out. The filter is severely wrinkled, and is unlikely to work. I’ve ordered a set of linear polarizing filters for 3D projection (and some classy glasses) from Berezin Stereo Photography. I was under the impression that I needed a split reel less than 400′, but it turns out the split reels I’m used to using were a lot bigger than 400′ (I think they were 1200′) which makes sense since in my head what I’m looking for is just about the size of a 400′ roll of 16mm film. So I’m planning to get one from Motion Picture Enterprises this week. They’re a few blocks from the office I’m editing in these days. We’re almost there. Next up is actually running some film through the camera. We’ll see how that goes. When I graduated from college, my dad and his wife gave me a 16mm Bolex camera from the 1950s. It was a neat gift, but the really unique thing about it was the Stereo Kit that came with it. 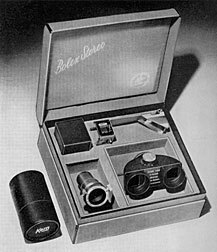 It was a complete set of stereo lens, projector lens with polarizing filters, and a small silver projection screen. The system works by putting two tall, skinny images side by side on each frame of film. Then when it’s projected, they are offset and overlapped with each one polarized differently, just like a fancy new 3-D movie. Rather than being widescreen though, the image is tall and skinny. Unfortunately in the past I haven’t had the time and money available to get the system going. The major thing missing right now is a 16mm projector that will take the 3-D lens. I can’t quite figure out what kind of projector it even needs to be. And despite being completely obsolete, they’re not always free. In the research I’ve done over the years I’ve heard that the polarizing filters in the projection lens tend to degrade over time. The projection lens definitely looks a little wonky. If that’s the case, then I’m going to have to figure out how to replace the filters. I’ll have to figure out what orientation they go in since they have to match the orientation of the glasses. I have brand-new 3D glasses provided by Coraline, which I’m pretty sure works on the same principle as the Bolex system. And of course I’ll need to get a 100′ load of 16mm film and run it through the camera. That’s not exactly free either. Being a wind-up Bolex, sync sound isn’t an option (I also don’t have a dual-system projector lying around, or a way to sync it up in the first place) so I’m thinking a series of silent sight-gags involving things flying at the camera. To save money I’m going to shoot reversal, which I haven’t shot since way back in the year 1999. Apparently Kodak stopped making the higher speed color reversal stock, so I’m considering shooting Tri-X 200D B&W reversal. I’m not entirely sure the system will work with color film anyway. That will be an additional experiment I’m sure. A 100 foot roll costs $25. Processing will probably run another $25. Oh, and I guess I’ll need a light meter. It’s also not clear that the camera will run well without repairs. Last time I looked into it I was told it needed about $200 worth of work on it.